I had never made a scene cake before and the idea was intriguing. 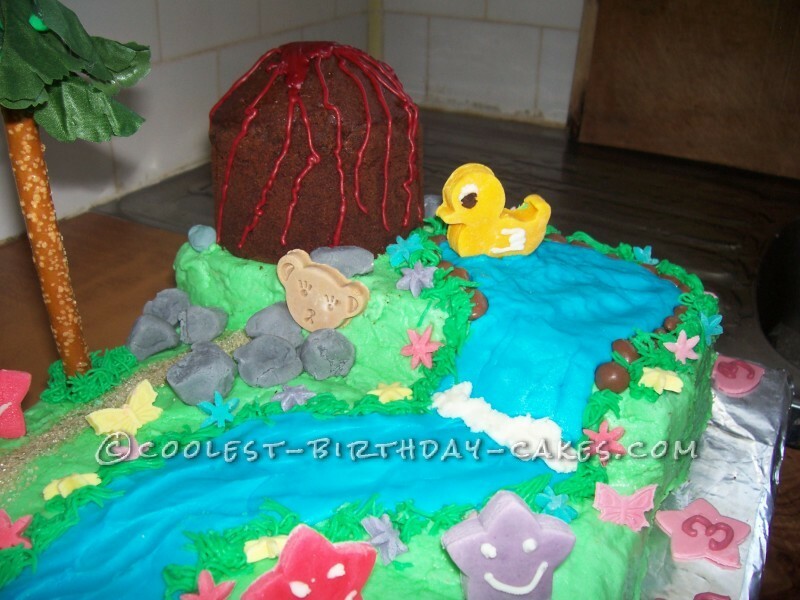 After looking at many photos of scene cakes, I decided that I wanted Dora to have an adventure. I baked 2 sheet cakes and 2 very small round cakes (all chocolate). As luck would have it, the larger of the two rounds rose up out of the pan and burst in the middle, which ended up being the perfect look for a volcano (I had initially wanted a mountain). 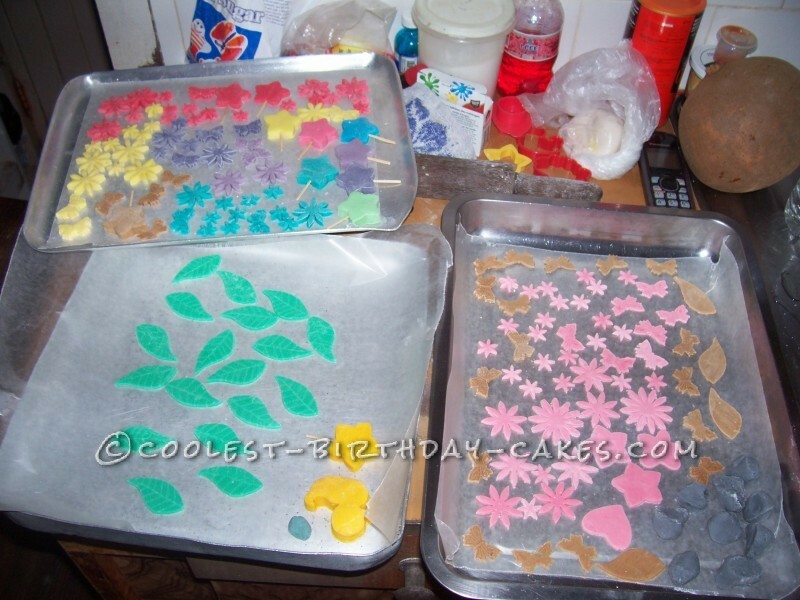 Two days before, using gum paste (with Wilton Gum Tex) I made 2 sizes of flowers, leaves, butterflies, a bear, rocks, stars and a duck. I inserted toothpicks into the base of the stars because gum paste dries very hard and cannot be modified. These were left to dry. Unfortunately the pan fell down and the petals off the large flowers broke but that turned out to be okay as I had no place to put the large flowers anyway and only used the small ones. I covered a length of cardboard (cut from the side of a large box) with foil. 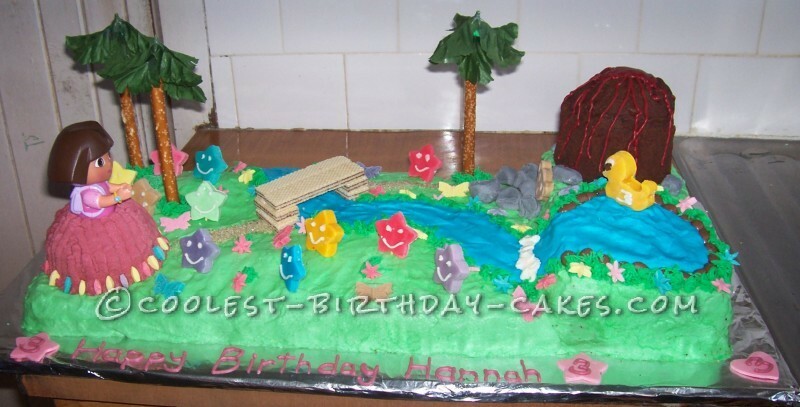 I cut a piece off one of the sheet cakes to use to make one end of the cake higher for the waterfall. I placed the 2 sheet cakes side by side (lengthwise) and placed the piece that I had cut off at one end. I iced the entire thing in green for grass. 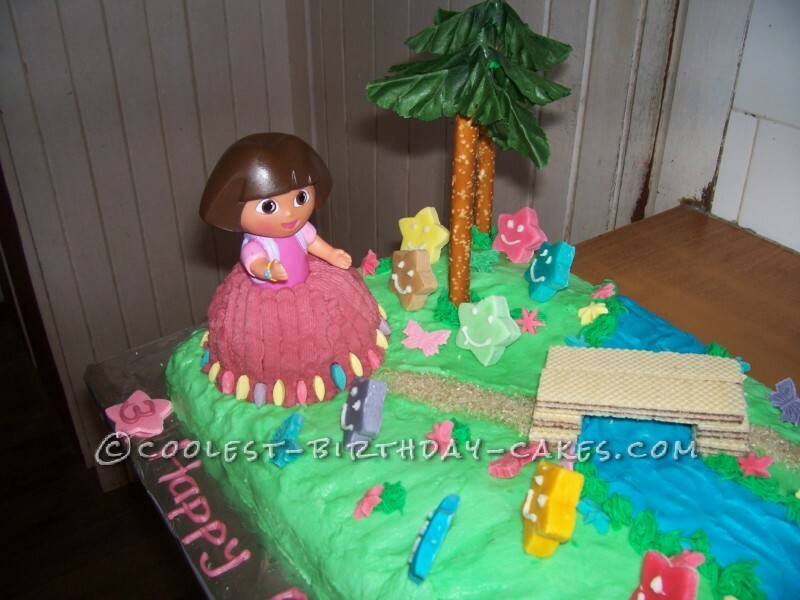 The smaller of the round cakes became Dora’s skirt (cut out the middle and place the doll inside) and the other was the volcano. After icing Dora’s skirt on, I used the petals the broke off from the large flowers to decorate the bottom of the skirt. I then added the lake and waterfall and river (using my hands mainly). The duck was placed on the lake and I outlined the edge of the lake with chocolate-covered raisins. 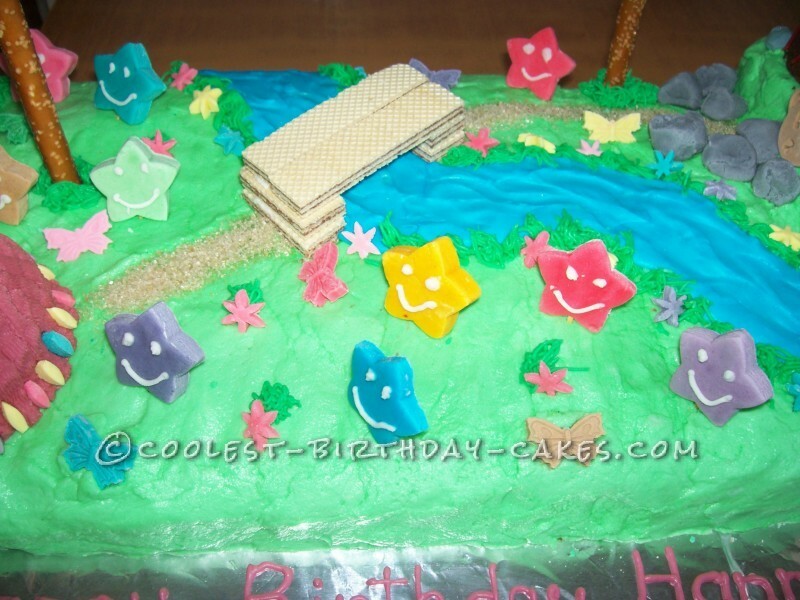 Some white icing became foam at the bottom of the waterfall and I placed grass along the edge of the lake and river. The small flowers were placed at intervals in the grass. Brown sugar made a path from Dora to the bridge, which was made of wafer biscuits, and then from the bridge to the base of the volcano. At the base, I placed the rocks and in the rocks was the bear (only the head as he was too big to put the whole thing). Long pretzel rods were the palm tree trunks and I used artificial leaves off some flowers as the palm leaves (I made gum paste leaves but had no way to secure them to the tree trunks). Some grass around the tree trunks and a few grass ‘bushes’ finished the forest nicely. I iced faces on the stars and then placed them around the forest and river along with some butterflies. I then iced the lava on the volcano (worst looking part of the cake if you ask me) and wrote Happy Birthday Hannah on the edge of the cardboard along with 2 stars piped with the numeral 3 on them. From the mixing of the gum paste to completion took 4 days and the cake ended up to be 23″ x 15″, but it was worth it. It was the highlight of the table and I think the adults were more fascinated by the cake than the children.